Pengarang MARK HUSBANDS AND JEFFREY GREENMAN, EDS. 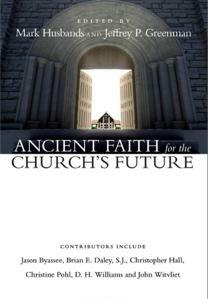 Bringing together select essays from the 2007 Wheaton Theology Conference, Ancient Faith for the Churchs Future demonstrates the vitality and significance of the early church for contemporary Christian witness and practice. The fourteen essays provide for a significant evangelical ressourcement by considering the importance of the thought and practice of the patristic church especially for our (1) interpreting Scripture, (2) engaging in missional witness through hospitality, social justice and evangelism, (3) renewing our worship and prayer, (4) grasping afresh our salvation through Jesus Christ, and (5) authentically engaging our surrounding culture. Fresh and forward-looking, this book leads the way toward a deeply rooted church that points beyond contemporary evangelical accommodation to civil religion, privatism and enlightenment methodologies toward its true vocation to bear vital witness to Gods present and coming kingdom.